In a recent study, researchers found compelling evidence of a yet-to-be-discovered planetary body with a mass somewhere between that of Mars and Earth. The mysterious mass controls the orbital planes of Kuiper Belt objects, or KBOs, in the outer solar system. 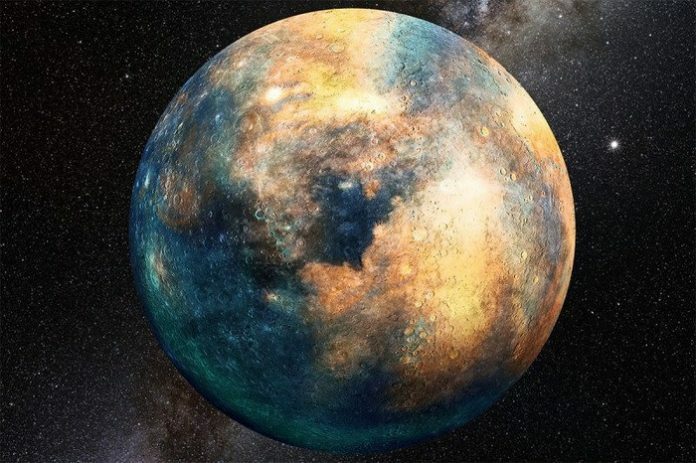 The finding suggests that the solar system is warped in the outer reaches of the Kuiper Belt and that there is an unknown Mars-to-Earth-mass planetary object far beyond Pluto. The study was done by researchers from the University of Arizona’s Lunar and Planetary Laboratory. Previous research found that the Kuiper Belt hosts a vast number of minor planets. Most of them are small icy bodies (the precursors of comets) and a few dwarf planets. In the study, the team analyzed the tilt angles of the orbital planes of more than 600 objects in the Kuiper Belt. They wanted to determine the common direction about which these orbital planes all process. According to the team, precession is the slow change or “wobble” in the orientation of a rotating object. They found that the in most distant of the Kuiper Belt’s objects, the average plane is tilted away from the invariable plane by about eight degrees. This suggests something unknown is warping the average orbital plane of the outer solar system. The object needs to be as massive as Mars to cause the warp that the team measured. The researchers rule out the possibility that the postulated object, in this case, could be the hypothetical Planet Nine. This is because that planet is predicted to be much more massive (about 10 Earth masses) and much farther. The authors suggest the hypothetical mass may be a planetary mass object. The data also do not rule out the possibility that the warp could result from more than one planetary-mass object. It may be a star that buzzed the solar system in recent (by astronomical standards) history. The researchers plan to do more observations once construction of the Large Synoptic Survey Telescope is completed in 2020. The instrument will take real-time surveys of the sky, night after night. The lead author of the study is Kat Volk, a postdoctoral fellow at the University of Arizona’s Lunar and Planetary Laboratory.